Mobilisation against the Traditional Courts Bill brought together women living in often remote rural areas around the country. In sharing their experiences with one another in meetings and workshops, what repeatedly emerged was how precarious their rights to land are. Here we tell the stories of Dudu Xaba and Cazile Hadebe, two women whose land tenure insecurity threatens their very existence. Their stories, two among many, show what is at stake when Parliament fails to meet its constitutional mandate to redress the land crisis created by the Bantustan system, and at the same time passes laws that bolster chiefly power. 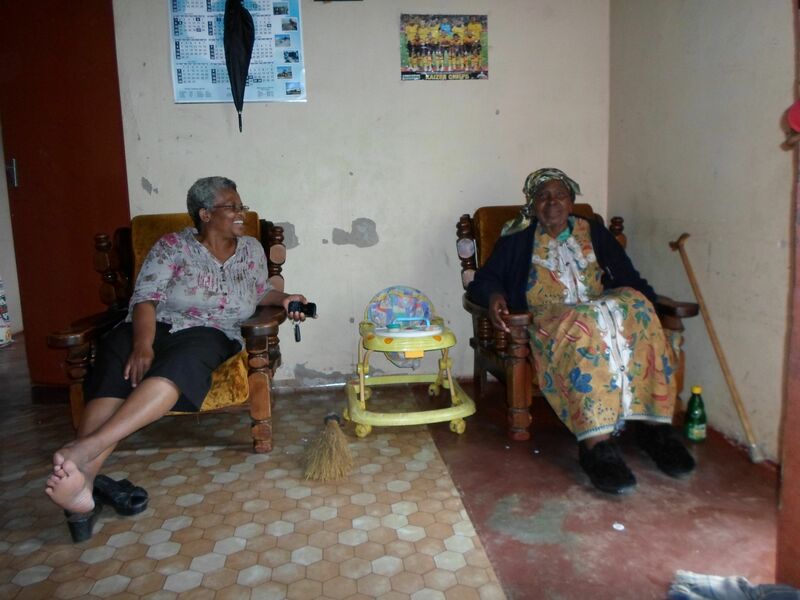 Mama Xaba relates a decades-long struggle to gain access to the land left to her in a will. Estranged from her father, who abandoned her mother when she was a young child, she did not get to know him before he died in 1990. A decade after his death, and only after her father’s second wife had passed away, did Mama Xaba discover that her father had left her his farm near Empangeni in KwaZulu Natal. To her this was a sign that her father had wanted to make amends for his absence. In a familiar turn of events, a half-brother intervened, asserting that the land was rightfully his. Despite never having lived on the land, he based his claim on his status as eldest male heir. The local chief supported his claim, declaring Mama Xaba’s father “mad” for having left his land to his daughter when he had a living son. Both son and chief threatened her with violence should she return to the land. Given the existence of a will, gaining access to the land would ordinarily be a simple process of a Deeds Office transfer. The land, however, falls under the jurisdiction of a traditional authority. As a result of first colonial and then apartheid law, land in this category is shrouded in uncertainty as to ownership, the right (if any) to “allocate” land, and the rights of current occupiers. The situation is further complicated by the role of chiefs, some of whom claim complete control over the land. Patriarchal structures leave single women particularly vulnerable in this situation. To address this legacy, Section 25(6) of the Constitution provides that any person whose land tenure is insecure as a result of past racially discriminatory laws or practices is entitled to redress. Section 25 (9) goes further, requiring that Parliament enact legislation to these ends. In 2004 Parliament passed the Communal Land Rights Act (CLaRA), ostensibly to give effect to these provisions. However, rather than rectifying the overt power imbalances typifying communally held land, the law exacerbated the problem of some chiefs acting as a law unto themselves. It was declared invalid by the Constitutional Court in 2010. Despite assurances to the Court by Minister of Rural Development and Land Reform Gugile Nkwinti that new, constitutionally sound, legislation would soon replace the CLaRA, there has been no progress in this regard to date. Instead, patriarchal power relations have been entrenched by laws such as the Traditional Leadership and Governance Framework Act (2003). Access to land, then, depends on local power relations. Single women, particularly those without male family members, have little status in the eyes of some traditional leaders and structures. Inherited Bantustan laws and regulations and the absence of the national tenure security law promised by the Constitution further undermine their position. Mama Xaba turned to the Commission for Gender Equality for help but was advised that her crisis “is not a gender matter”. She is still waiting for assistance, despite years of concerted pleas and numerous letters. Once a fertile sugarcane farm, Mama Xaba’s land has reportedly been rented to people who have built an informal settlement. Meanwhile, she lives alone and indigent in Krugersdorp. Unable to work after a car accident that left her disabled, she lives off the charity of others. Also in KwaZulu Natal, Cazile Hadebe, an 85-year-old widow, points to the dry, grassy land surrounding her house. She explains that the land, which has been in her family for countless generations, was once a verdant garden. On it she had grown maize, beans, pumpkins, sweet potatoes, spinach, tomatoes, onions and beetroot. She produced not only enough for her and her family to eat but also surplus for sale. Some years ago a group of men from a neighbouring village began driving their cattle to graze on her land. Their cattle knocked down the fences and destroyed the garden. Receiving no local support, she took the matter to the traditional council in the area in which the cattle-owners lived. There she was told that she could only be heard if a male relative represented her. Having no male relatives available, she brought with her a member of the local traditional council. She was awarded no compensation and the cattle continue to graze on the land. Mama Hadebe now tries to support her seven dependants on a social grant. Every month she gets deeper into debt with loan sharks. Mamas Xaba and Hadebe’s problems are intractable, with no solution available in practice or law. The government has exacerbated the legacy of apartheid by its unqualified support for traditional leaders. What is needed is for the legislature to fulfil its constitutional mandate and pass a law that secures the land rights of women and men in “communal” areas. Such a law should not default to rigid colonial and apartheid distortions of custom, but instead be informed by notions of living customary law as well as the transformative imperatives of the Constitution. Frances Ann Eberhard is a researcher with the Rural Women’s Action Research Programme at the Centre for Law and Society, University of Cape Town. Sizani Ngubane is the founder and director of the Rural Women’s Movement, a community-based organisation in KwaZulu Natal. For a photograph of Sizani Ngubane (left) and Cazile Hadebe, click here.